University Relations has displays, handouts, and branded materials available for use by system offices for events and meetings with outside parties. Requesting units are responsible for pickup except for small quantities. If you have questions, please call 217-333-6400 or send an email to infosource@uillinois.edu. The University Relations publications page lists materials available for leave-behinds. It includes Pocket Facts, the annual report and other publications. The pieces are excellent tools for educating various audiences about the breadth and depth of the impact of the U of I System. The items below area also available to system units without charge for use for guests and constituents (not for personal employee use). Please only request the quantity needed. University Relations reserves the right to limit quantities, charge a fee, or decline requests. Requesting units are responsible for pickup except for small quantities. Each item notes a location. Arrangements can be made to transport most items to a different University Relations office for pick up; please call 217-333-6400 for details. Requesting units are responsible for returning items to the same (lending) office in good condition. Units returning damaged displays will be charged for repairs or replacement. To save time, please download and complete the banner agreement (Word document) and bring it with you when you pick up your item. All backdrops are 8' x 8' and are easy to pop-up. Design choices and storage location are listed below. Colorful campus collage with U of I System logo and Altogether Extraordinary. Located in Urbana. Dark background with repeated horizontal U of I System logo, with Altogether Extraordinary. Two available (Chicago, Urbana). Dark background with seal image, repeated stacked U of I System logo. Two available (Chicago, Springfield). 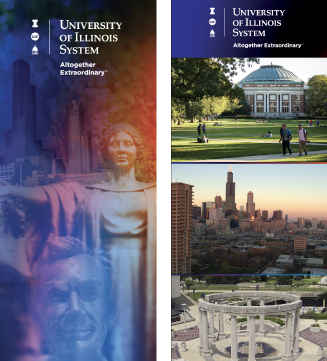 Banner stand, U of I System logo and campus images, 39" x 80" - two designs. Heavy base with windowshade banner that unrolls from the base and hooks onto pole. Comes in compact carry case. There are four banners total--one of each in Chicago and Urbana.